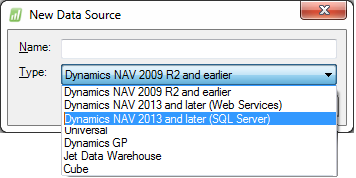 Jet Reports (version 14.1 and higher) includes a data source type for Dynamics NAV 2013 and later (SQL Server). For organizations and users with direct access to the local SQL Server on which their NAV 2013 (or later) database is stored, the "SQL Server" type of data source can provide substantially faster reporting access than is traditionally possible through NAV's Web Services. 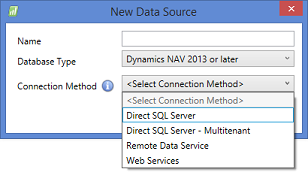 Jet also includes a similar Connection Method for Dynamics NAV 2013 and later - Jet Remote Data Service - which allows for access to your NAV database when it resides on a different network domain than does your installation of the Jet Excel add-in (system administrators can review the admin guide for this data source type for more information). Versions of Jet Essentials 2013 through 2015 require that NAV be configured for Windows Authentication. Use of NAV User/Password Authentication requires Jet Reports 2015 Update 1 or higher. A SQL Server login that allows read access to the entire NAV database. It is also possible to assign a Windows user the same permissions - if you are not using Mixed Mode authentication on the SQL Server. Again, this does *not* have to be the same Windows user that is described in Requirement #1. If the NAV license has been uploaded on a SQL server-wide basis (which is the default) then the license is located in the $ndo$srvproperty table of the SQL Server master database (not in the NAV database). Users must have read access to this table in order for Jet Reports to verify the NAV license.